Holiday road trips may have something exciting at the end, but getting there is a whole other story. There’s a reason why the road trip is part of any good family comedy – parents and kids alike start to get a little wacky after being stuck in the car together for umpteen hours. Your tech gadgets may distract your kids for a little while, but when they’ve had their fill of cartoons, you’ll need something else up your sleeve. With these ten road trip games prepared ahead of time, you’ll be able to turn a potential temper tantrum into a distracting and fun hour or two. Choose a passing car and take note of its license plate. Challenge: Pick a theme for the acronyms, like food or school. If you’re in a busy area, you can play this game for as long as it holds everyone’s attention. The first person says a celebrity’s name. For example, Justin Bieber. This game can go on for a long time, and you’ll get some quiet time as each person thinks of their celebrity’s name. Gather a selection of “getting to know you questions,” like this list of 200. Have each person answer the question before moving on to the next one. You’re bound to learn something new about one another, and questions will spark additional conversation and storytelling. Each person secretly picks their favorite book. Draw a scene from the book. Ask everyone to guess the scene. If you have little ones on the verge of sleeping, an activity that requires focus will tucker them out quickly. Create lists of things to look for during the trip. As you see something, cross it off the list. You can include rules that make things more interesting, like only allowing the first person who spots an item to be the one allowed to cross it off. Give a prize to those who complete each category first. Everyone will pick up this game as they feel like it, but it’s not something you’ll need to focus on for a long period of time. 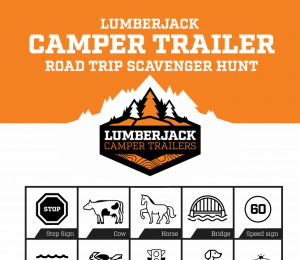 We’ve put together a Lumberjack Australian Scavenger Hunt to print out and use. Get each sheet laminated and buy some whiteboard markers so you can reuse them for many road trips to come. For a spin on the classic game, print out I Spy sheets – you can find a tonne online. If you have two or more kids with you, have them race against each other to complete their sheet first. This is a great game even if you only have one child with you, and it doesn’t have to involve the parents, like traditional I Spy does. Each person continues in this way, naming all of the items so far and then adding their own. Not only is this game fun and entertaining, but it will strengthen everyone’s memorisation skills. Each player does this with the next letter of the alphabet. This game can be adapted in endless ways, with different sentences that have changing adjectives, nouns or verbs. List the letters of the alphabet on a sheet of paper. Fill in the list with things they see during the road trip. This is a simple game with minimal materials, and the list can be continually added to throughout the whole trip. One of the best things about ti is it is a completely different game depending on where you are road tripping. 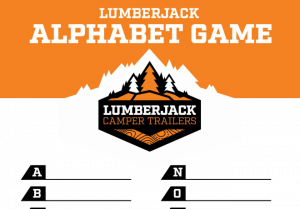 We’ve put together a Lumberjack Alphabet Game sheet for you to print out, laminate and keep in backseat pocket of the car for whenever the kids get restless. Using a magnetic alphabet set and a baking sheet, ask your kids to spell out various things you pass. Spelling games hold interest while being educational. Do you have a road trip game that was a hit with your kids? Tell us about it!